Were the World Trade Center Transit Hub's lateral struts part of the original Calatrava design? 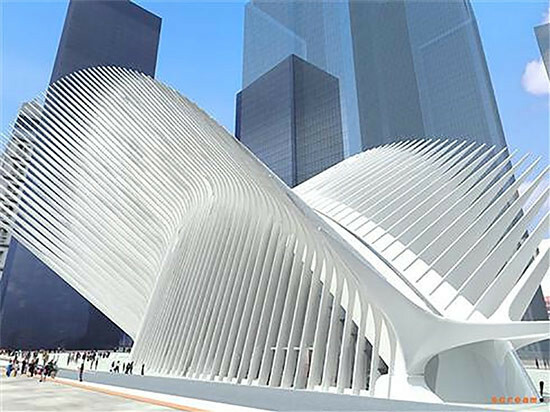 - Archpaper.com Were the World Trade Center Transit Hub's lateral struts part of the original Calatrava design? The World Trade Center Transportation Hub—or as its designer Santiago Calatrava likes to think of it, the “bird in flight”—is just blocks from AN‘s office, so we get to walk by and watch it try to take off regularly. 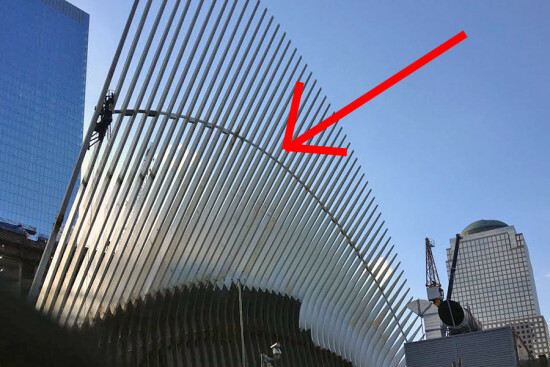 But in the weeks before the holidays, odd “struts” started to be welded between the structure’s giant fins or blades. Not only do these lateral supports detract from the elegance of its long thin blades, I don’t remember seeing them in the renderings of the station. So I went back through every image I could find online and none show these connectors. In many of the renderings, the overlapping of the transit hub’s fins obscures where the connectors would have been located. The renderings fades into solid white, obscuring those areas from clear view. Could it be that these were added later in the design process or did Mr. Calatrava know all along that these were needed to help support the weight of the fins? What do you think? Do they compromise the design?